What lovely weather we’ve had this week, don’t you agree? It was downright warm around here, and I was inspired to paint my toenails and pull out my box of sandals for the first time since last fall (except for that trip to Hawaii). At our house we’ve been absorbed with Little League practice and games. Trace is managing Jack’s farm team, which is coach-pitch, and there’s nothing more fun than watching my husband throwing a ball to our son. Besides that, the farm players try so hard, and they’re so darn cute–it’s great to watch! Coffee bushes of MICHIZA, in Oaxaca. Photo courtesy of Coopcoffees. Speaking of Trace, for years we did not carry Mexican coffee, because the beans gave Trace extreme allergies. He would sneeze until his eyes were bloodshot, without pause. I imagine that it was something that was sprayed on the beans before shipping, some kind of fumigant, but it could have even been in the burlap sack. Keep in mind that we’ve been in business for 31 years this month, and the regulations for agricultural pesticides have changed a lot since 1982. What ever the reason, we did not order Mexican coffee until the advent of more organic options in the last ten years. The lack of Mexican options around here has strictly been a matter of health: Mexico produces some great specialty coffees. The organic ones that we’ve cupped lately have had great depth of flavor. This week’s coffee is from Oaxaca, from a co-op named MICHIZA, which stands for the six different ethnic groups that are included in the co-op. You can read more about them on their website here, and on the Fair Trade Proof page here. The cooperative specifically works to advance and promote women, and I loved the picture of the coffee farmer above. In a machismo culture, any place where women are supported is significant. We’re proud to offer a coffee from MICHIZA. More than that, it is good coffee. It is roasted light, and it is very mild with nutty and carmelly tones. It has the sweetness of roasted hazelnuts, so it pairs perfectly with chocolate for a pick-me-up. Oh, in other news, the winner of this week’s giveaway is Liz. We’ve got another chance to win this week: one of our hot travel mugs, filled with the drink of your choice. Come on in and enter! You can use the code of the week to sample our Fair Trade Mexican at the same time (it’s burlap sack). It’s also on sale this week for $12.99 a pound. Enjoy! My days are starting earlier now: I get up at six so that I’m ready before the kids get up. Gone are the days of luxuriating in a summer breeze cooling down the sheets, knowing that the kids aren’t up yet. Those days will return (it is the weekend tomorrow), but in the meantime I’ve been enjoying the glimpse of the sun low on the horizon as I sip my morning coffee. The beams sneak through the trees to shine on my new succulent plant and to wish me good day. Two weeks ago we moved the coffeemaker to our bedroom, and I’m loving the new ritual of choosing a favorite mug the night before so that I don’t have to leave my sanctuary for a few more minutes in the morning. I treasure the calm. This week we’ve been drinking the Bali (wasn’t it wonderful? ), but the pound I take home today will be our Organic Fair Trade Mexican. We don’t carry a lot of Mexican coffees, for a personal reason: for many years Mexican coffees gave Trace extreme allergies. With the heightened availability of Organic Mexican coffees in the last ten years, we have been able to carry more of these high-grown coffees without adverse effects. I’m sure the reaction was to something sprayed on the bags or the beans, not the coffee itself. Oaxaca borders the Pacific Ocean, and coffee has been produced here for centuries, brought over by European sailors. The state has a diverse population, and varied terrain, so that most farms are still small family affairs, or co-ops where a group works together. Oaxaca also grows a lot of chocolate, or rather cacao beans, which are native to the Americas, but are now grown around the world in similar regions as coffee: between the Tropics of Cancer and Capricorn. 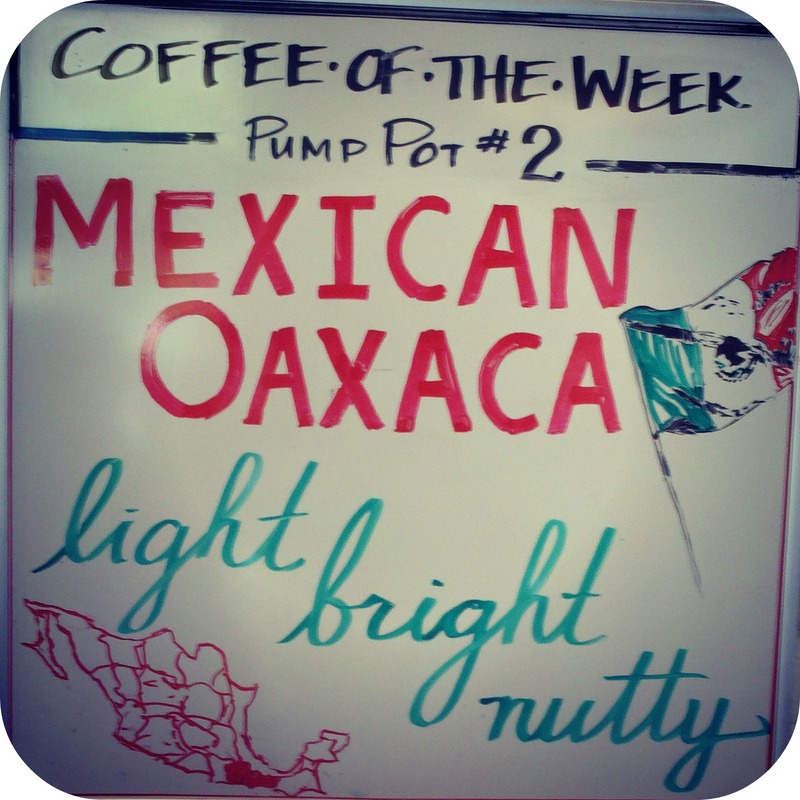 Our Organic Mexican Oaxacan is roasted light, and you will taste chocolate notes as it cools. We sampled it earlier this week as a single varietal espresso, and as such it has bright tones and beautiful crema. I prefer our regular Espresso, with its creamy and smooth tones, but it was educational to see the difference. As a cup of brewed coffee, you don’t taste as much forward acidity: I’m drinking it now and the predominant taste is light berry and nut flavors. There is a coupon below for a free cup: we’d love to hear what you think, on our Facebook page or in the comment section here. Have you visited Oaxaca? What was your experience like? Come in and let us know while you drink a cup on us!